To attract top tier employees, Human Resource managers are being increasingly creative with the types of benefits they offer employees. Better health insurance policies, flex-time, child-care, legal assistance, employee wellness programs. The list of new benefits is constantly growing. 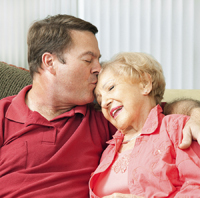 According to the Centers for Disease Control, more than 34 million unpaid caregivers provide care to someone age 18 and older who is ill or has a disability. The majority of these are family caregivers. Employers are taking notice to this trend, and reacting accordingly. Eldercare support has become an important benefit that is allowing employees flexible schedules and even leaves of absences to be able to attend to the issues of their family members. Human Capital Magazine online recently published an excellent article highlighting this gradual change in human resource management. Although there are many improvements that can still be made, it is heartening that many employers are actively doing their best to take care of their loyal, hard-working employees.